The CoStar Industrial Report for First Quarter 2014 provides us with confidence that Central Pennsylvania maintains its value as a hub for warehousing and distribution. This should come as no surprise considering the area is at the center of many major transportation routes and is within a one-day drive to over 70 percent of the U.S. population. Many businesses, large and small, have taken note and planted roots in Central PA with one or more warehouse/distribution facilities. Over the years we have seen the ebb and flow of this real estate segment, but we are currently experiencing a state of growth. 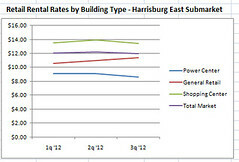 What are the current trends in industrial real estate in Central Pennsylvania? Let’s take a look at the numbers! Since last quarter, vacant square-footage has dropped from 18,333,335 to 17,856,244. 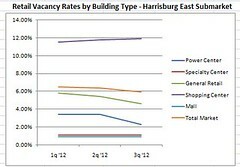 The vacancy rate (currently 7.48 percent) continues to trend downward from its high of 9.4 percent in Second Quarter 2010. As a response to this decline in vacant space, the quoted rental rate has risen ever so slightly from $3.88 last quarter to $3.91, the highest rate in over a year. Last quarter, net absorption surged to 1,783,592 square feet – the highest number we’ve seen since Second Quarter 2010. However, First Quarter 2014 experienced a drop in this number back down to 477,901 square feet. While net absorption isn’t at an all time high, it still shows that more square footage was leased last quarter than what was vacated. This further demonstrates the health of the industrial real estate market in the area and its demand for warehousing and distribution space. When viewed at as a whole, these numbers tell us is that Central Pennsylvania continues to be the “go to” location for warehousing and distribution. Looking toward the future, this trend is sure to continue. Two well-known retailers (Nordstrom and Urban Outfitters) will occupy distribution facilities currently under construction totaling over 2.28 million square feet. When complete, the two buildings will be among the largest in the county devoted to distribution and fulfillment. In fact, 3 of the top 4 properties under construction in the Greater Philadelphia industrial market are located in the Central Pennsylvania submarket. Once completed, these facilities will drive new jobs to the area and pump money back into the local economy. Urban Outfitters aims to create at least 500 jobs and Nordstrom aims to create 369 jobs (within three years and up to 700 eventually). This market report is a positive sign of industrial growth that should continue to climb. Central Pennsylvania is actively creating an environment conducive to businesses looking for prime warehousing and distribution. The new sites for both Nordstrom and Urban Outfitters are eligible for tax abatements. Additionally, the Urban Outfitters site is in a Keystone Opportunity Zone, which gives it 10 years free of property taxes and most state taxes. As online shopping becomes many retail companies’ largest revenue stream, the need for central warehousing and distribution will continue to increase – and Central Pennsylvania offers one of the most uniquely qualified areas to fit this booming industry. However, we must keep in mind that the scarcity of sites for more than one million new industrial distribution facilities will limit the supply of new space. If you were looking to rent warehouse or distribution space, would you choose Central Pennsylvania? Share why or why not by commenting below!